In any environment where high volumes of cardboard boxes, plastic wrapping, shrink wrap and similar packaging are encountered, a safe, simple and efficient box cutting solution is a vital tool for business efficiency. The Mini Disposable Safety Box Cutter is ideal for warehouse work, retail and even home use. Featuring an obscured blade, the Mini Box Cutter is designed to help users implement a streamlined and injury-free package opening process. 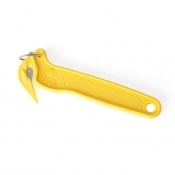 The Mini Disposable Safety Box Cutter is optimised for both speed and safety. Its cutting blade is sheltered by a 'spike' that is ideal for piercing shrink wrap or cling film. The Mini Box Cutter also features indented finger/thumb grips which allow it to be pulled towards or pushed away from the user for a smooth yet effective cutting motion. The box cutter is functional on both sides: as well as its main obscured blade, the Box Cutter features a handy tape splitter on its reverse side – perfect for opening tape-sealed cartons or scoring corrugated cardboard to simplify folding and tearing. For detailed instructions, please click the PDF link below. For use with more robust packaging, such as thick or corrugated cardboard boxes, please see the Heavy Duty Box Cutter. Quality mini box cutter. Decently sharp blade. Light weight and perfect to keep in my pocket, without the threat of cutting my fingers. Prompt delivery via my postman, better than couriers!